Rain lilies rejoice in occasional dowsings, but other plants prefer to live in a damp, or even flooded, environment. Powdery thalia is such a plant. As its name suggests, it lives comfortably alongside the alligator in bayous and backwaters. If you see this flag flying, it’s best to keep a sharp eye for one of its usual companions. Even before flowering, its three to six foot bloom stalk isn’t hard to spot. And once the blossoms appear, their messy splendor and vibrant color shine in a world often overwhelmed by shades of green. Best of all, the flowers don’t bite. If I lived near you I’d definitely be flirting with the alligators to see plants like this. It’s a beauty. I’d never seen it until last year. Once the waters and the alligators recede, I’ll be looking for it again. You certainly live in an exciting place. I just noticed on the USDA map that there’s a narrow belt of counties through Arkansas and Missouri that shows the plant just getting into a county or two in far southern Illinois. On a geographic map, it shows that belt includes the St. Francis Sunken lands Wildlife Management Area: “A long, narrow wetlands area covering nearly 27,000 acres, known for duck hunting & fishing.” You might not need to come all the way down here to see it. Thanks for pointing that out~I never consider southern Illinois and probably should. It’s a very interesting plant, that powdery coating is very noticeable. During the flood, that banner should have been hung in places well outside the bayou. You’re right that the powdery coating is obvious. I’m glad you could see it. Until I learned that powdery thalia was another name for the plant, I thought it had powdery mildew. Not so. When it’s a wet summer, there can be a lot of powdery mildew around here – it can show up on pretty much any flower, but the garden phlox is the one that gets totally covered. Everybody runs around spraying baking soda on them. This powdery thalia is pretty interesting, I’ve never seen it around here. It’s a very nice photo you took. It’s range even in Texas is limited, since it’s a tropical plant. You can see where it grows here. This was one of the first times I’ve used my 70-300mm lens for this sort of image. The plants were so far out into the water that there was no other way to take the photo. If you’d wanted to pick one, you probably only would have disturbed some frogs and snakes, but you would have needed to wear your waders. My boots weren’t enough for this one. That’s a pretty plant! I would love to see it and it’s namesake on any given day! Speaking of rain — have you gotten any? Well, sure. It’s not a plant that ever would be called elegant: at least, not the blooms. But I do love those svelte buds. I’m not sure the alligators are the ones who plant them, though. My theory is that Nature herself puts them in the bayous and sloughs to warn us away from the alligators — who still may not have figured out that the flowers are functioning like a pin flag on a golf course. This is beautiful — it reminds me of muscari. I’d love to plant these but given that they need rain, it would be a hopeless cause! Never heard of them before but I find them wonderful! It’s not rain they need so much as a continually wet environment, like a pond. Of course, the rain helps keep the pond full, so there’s that. But they wouldn’t do well at your ditch, because they’re a tropical plant. You get your lilacs and forsythia, and we get thalia. I did search through the holdings at some of the arboretums and botanical gardens around you to see if someone has them in a controlled environment, but it seems not. If you’re ever farther south and spot a water garden, though, you might look for them. The blues and purples really are marvelous. So you’ve let your freak flag fly. It’s kind of pretty, but I don’t think I’ve ever seen a real one. Thank you, Linda, for educating me today. As for the alligators, um, I think I prefer the stuffed kind that Dallas chews on, ha! You’re in the same situation as Jeanie and Melissa: a little too far north for this to be growing in your neighborhood. Of course, I’m a little too far south for many of your beloved flowers to thrive here; we just have to make do with what we have! An alligator makes a perfect chew toy, actually. That nice, long tail gives Dallas something to hang on to while he’s playing — and gives you something to hang on to while you’re playing with him! Quite unique, unusual and beautiful at the same time. A friend in Florida tells me that you have a similar plant. 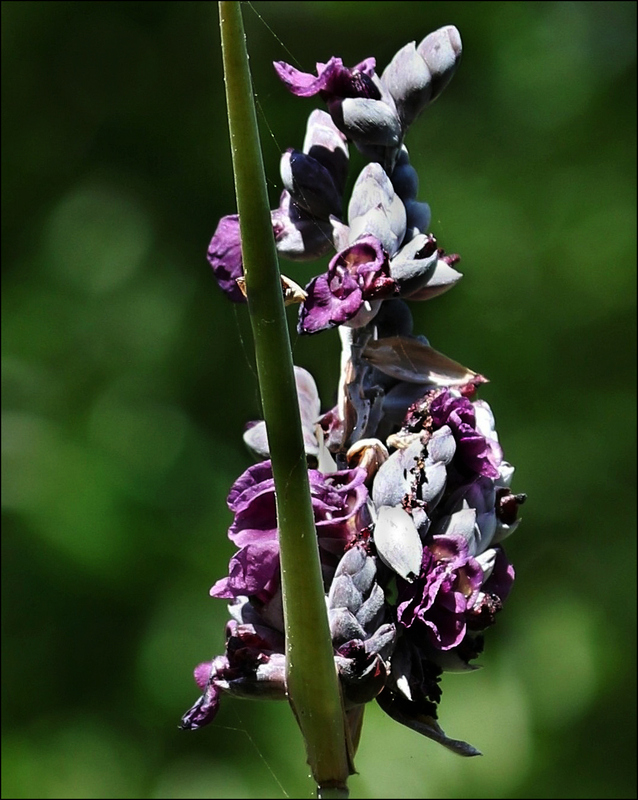 It’s also called alligator flag and is in the same genus, but it’s a different species: Thalia geniculata. The flowers are a little different, and they droop, but the leaves are much the same. There’s a short video in the link. It’s so noticeable with its big leaves that you may have seen it. Okay, the minute I saw the video, I knew what it was – thanks! Unusual and quite beautiful I think. The stalk would be easy to spot. It is easy to spot, especially when it’s decided to grow right in the middle of a pond. 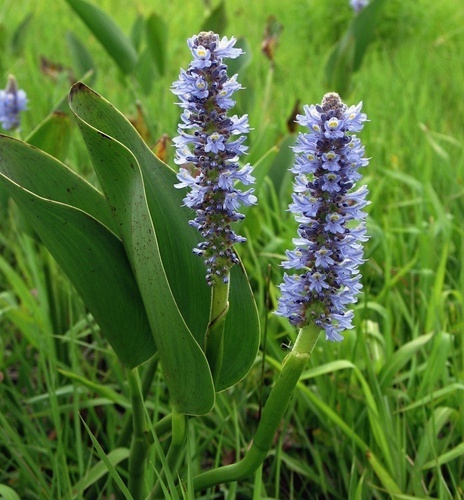 For a time, I confused the leaves with those of pickerel weed, but I think I have that straightened out now — and there’s certainly no mistaking the flowers. No teeth visible, beauty abounds. Do I remember that you have pickerel weed in your pond, Tina? If you can grow that, this plant should do well for you. It’s not shown as native in Travis County, but it can be found farther north than Austin, a couple of counties to the east. And, no — no teeth at all. Just a wonderfully unusual plant whose blooms look like they’re on the way out as soon as they open. It, the alligator flag, is a beautiful flower and one would want a tall and narrow vase. Birds of paradise flowers are sometimes sold in flower shops together with a flower that can reach 20 feet high called the Gymea lily. I’ll say it sends up a flower spike. It’s not only tall, like our century plant’s bloom, it’s gorgeous. I found this lovely photo of a bird enjoying its nectar — just extraordinary. I never had seen a bird of paradise outside of a flower shop when I was growing up, and not often there. Now, there’s a large stand of them blooming outside my Walgreens drugstore. When I asked why the flowers were there instead of the standard green hedge, the answer was that the manager thought green hedges were boring and wanted something people would notice and enjoy. It was at about that point that the store won my business. I’m captivated by this URL: lindaleinen.com A photo website that posts exquisite images such as these. Glad to have found you and way to go Linda! I’m glad you found your way here, Arti. I posted about this new site when I began it in March, but I’ve never tweeted links to it. I suspect if I had you would have discovered it sooner. In any event, yes: it’s a place for my to share some of the photos I enjoy, while still keeping my writing over at The Task At Hand. I’m enjoying it very much, and I hope you do, too. 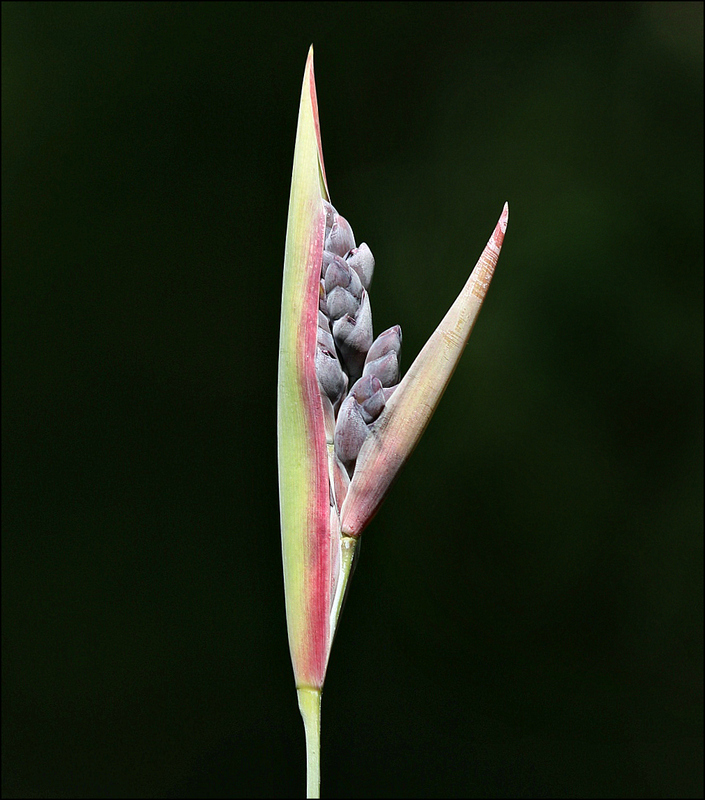 When you look at it in bud, you think Thalia dealbata is going to be a flower like the bird of paradise flower, but when it opens, it goes in a completely other direction. Yes, do mind the gators. They are not among Nature’s finicky eaters. The last time I was at the Brazoria Wildlife Refuge, prior to Harvey, a couple was walking down a road near the visitor center slough with an unleased dog. The curious dog kept making for the reeds and grasses at the slough’s edge. I stopped and asked them if they’d see the signs to keep pets on leashes. They had, but said they didn’t like curtailing their dog’s freedom. I wished them good luck, and kept on going. The contrast between that elegant bud and the frowsy blossom really appeals to me. Most of us, before a big appearance, try to “clean up” a little, as the Texas phrase has it. Not this plant! It looks most attractive, especially in its early stage. Your remark about a pin flag on a golf course reminded me of the warning signs at the golf course near my sister’s home. Crocodiles regularly take up residence in the golf course lake. I see from a quick search on Google that alligators are similarly fond of Houston golf courses. Perhaps more of the courses should plant alligator flags. Now, that’s a clever idea. We have those signs posted, too: on golf courses and fishing docks as well as in the state parks and refuges that are laced through with bayous. Even in the midst of Harvey, it was impossible not to be just a little amused by the number of displaced gators that were showing up in weird places. One fellow returned to his flooded home, and found an eight-footer in his bedroom. I just commented to WOL, above, about the interesting difference between us and the flower. We start messy and try to straighten ourselves up prior to going out in public. The flower, on the other hand, begins in elegance and ends in — pure messiness. I suspect it’s for the convenience of pollinators, but it still amuses me. Most amusing. My habit, which thankfully is not public, is to start out reasonably neat when I go to bed, and to wake each morning with my hair looking very like the open alligator flag. It’s a beauty, and so unusual. 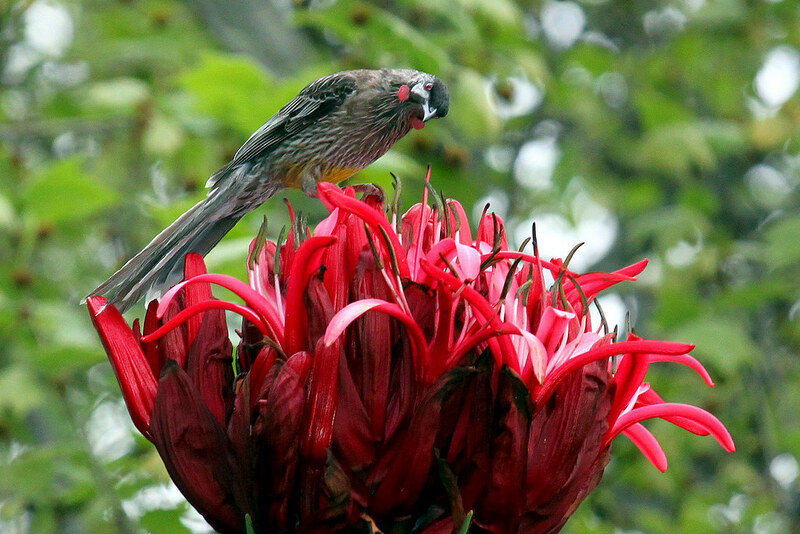 I wonder whether the beak-like way of opening (it’s the same in bird of paradise plants) has some useful function. There’s always something new to learn — each of these plants has their little quirks, just like people! That’s a completely new flower to me, and so well named. I love that first photo, so straightforward and clear. Don’t you find that the details of the process of photo-taking sometimes give you an extra dollop of pleasure? When I look at a photo like this, I not only admire the end product, I remember lying flat on a boardwalk, shooting through the slats in a fence, with every new group of people that walked by saying, “What are you looking at? What are you photographing? That? Really?” I mentioned to Pete, up above, that this was the first time I’d used my telephoto lens for floral photography, too. The end product is important, but so is the process. 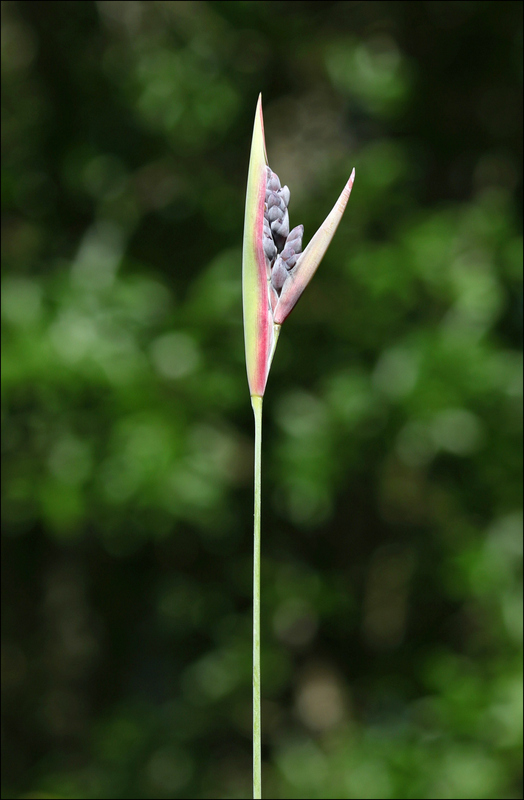 Thalia dealbata is an interesting name and the plant, before it begins to unfurl Is actually pretty in its rather dainty appearance. It seems to be a striking plant up close in those first photos that you posted. But you are far braver than I, since anything to do with gators gives me the willies. Of course, I reckon that you know how to spot them and where they might be lurking but none the less, I just could not live near where the gators live. I didn’t have to be very brave to get these closeup photos, Yvonne. I had my trusty telephoto lens to help me along. From the boardwalk where I was perched, there wasn’t a chance of an alligator getting me. Even in the refuges or out in the bayous, the alligators aren’t particularly interested in attacking. During the mating season the males get a little rowdy, and you don’t ever want to get between a mama and her babies, but otherwise, that big sploosh! you hear is one of the creatures going the other way. The biggest problem is people feeding alligators. They lose their natural fear of humans that way, and can become a nuisance. I would like to get close enough to one of these plants to feel the texture of the buds, and get a better photo of the flowers. I suspect they have a structure that’s not quite so chaotic. I hadn’t known about this (new?) blog of yours, Linda, and was glad to spot it in your usual blog’s side panel. I’m glad you discovered it, Val. I started it only in March, but it’s been fun. One of these days I’ll get out and about with the camera again. It’s been a long, hard slog through the summer. Just when things were straightening themselves out, Hurricane Harvey showed up, and everything went topsy-turvy again. But life is getting back to normal, and a little routine is developing again. This plant is a true tropical, so if it’s in your part of the world, it probably would be only in a greenhouse or some sort of tropical display. We have so many beautiful water plants — but only one or two others with such threatening names. I consider ticks dangerous and, although taking precautions, consider it risky to crawl on the ground through brush and detritus to photograph flowers and insects. Alligators on the other hand would be a serious deterrent. Lovely flower and nice images. Until I started roaming with my camera, I’d never seen a tick in Texas. Now, the count is up to two. It seems that fire ants enjoy devouring ticks, so in that sense the little demons are good. On the other hand, sitting on fire ants isn’t so good — but it does make a person more attentive for a while. There’s another plant here that takes its name from the alligator: alligator weed, or Alternanthera philoxeroides. It’s a terribly invasive species from South America, given to choking off waterways and beating natives into submission. It would be pretty enough, if it weren’t so nasty. To a degree opossums keep the numbers down.sucking up ticks like party treats. That’s a new one to me – so elegant at the start and then so – unique—- I’m left with a bit of a puzzled scowl and wishing to see the flower in person to inspect it closely…..
As I read this, I was thinking, ‘She needs some waders!’ — hahahaha! If I were there, most likely we’d be like Lucy and Ethyl trying to retrieve a good specimen! Oh, isn’t that the truth! We’d have a good time doing it, too.